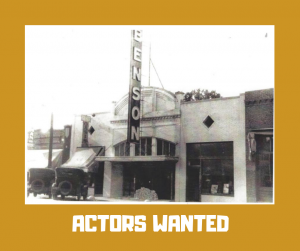 BENSON – Are you looking for a place to hone your acting skills? The Benson Theatre Project is pleased to announce the launch of the Benson Theatre Troupe, a multi-faceted group of performers who will appear in variety and radio shows as well as other events. Lara Marsh and Reo Jones will serve as the troupe’s artistic directors. Marsh is pursuing her master of arts degree in directing at the University of Nebraska at Omaha, and Jones is active in the local theater community. The duo is seeking actors of all types – voice, physical and vaudeville style – as well as singers, performers and dancers. Positions are open in two categories: short-term players for events in the near future and long-term players interested in helping grow the company. Auditions will be held Saturday, Feb. 9, at 2:00pm at The B Side of Benson Theatre, 6054 Maple Street. Those interested should bring any material they’d like to read. Callbacks will be held Friday, Feb. 15, at 6:30pm at B Side. Audiss said the first production, a radio show, will be held Friday, March 23. For more information, contact Marsh at 0608lmarsh@gmail.com or Jones at eojfjones@gmail.com.